Drug addicts. Indolent. Uneducated. If only the poor would (fill in the blank) they could escape the cycle of poverty they are trapped in. We have all heard one version or another of the above argument to explain away, or worse, justify poverty. However, as long as our focus is on finding an explanation for poverty, ending it will remain a low to non-existent priority. Poverty isn’t that complicated. It is, by definition, a lack of resources. Any attempt to complicate it much further than that typically ends by heaping criticisms upon the poor that hinder rather than help. Major deliberations regarding poverty’s cause, be it in academic or public policy circles, too often identify the individual as playing a starring role, leading inevitably to the conclusion that there are at least a few undeserving poor. Any reasonable policy adopted to assist the poor must then contend with these persons if it is going to work. Giving money unconditionally will, we are told, be wasted on junk food, alcohol, or gambled away quickly in an undisciplined spending spree. Spending on the poor must be miserly and rigorously regulated because their poverty is proof of their inability to make wise choices with the money they are given. This was, in fact, the premise of welfare reform in the 1990s. That there were people living in poverty unworthy of assistance had become (and continues to be) something of a self-evident truth that was literally written into the title of the legislation President Bill Clinton signed into law in 1996. Known as The Personal Responsibility and Work Opportunity Reconciliation Act, the law clearly was named to communicate the message that many poor people are irresponsible and lazy. Welfare reform had become code for cutting off those deemed undeserving of assistance. The failure to work, or work hard enough, liberated the government, and by extension taxpayers, of any moral obligation to provide assistance. The fact that going back to work often meant even less money than welfare provided, particularly for single mothers, seemed to matter not at all to champions of “reform”. That there are people out there taking advantage of the system cannot be denied. Whatever system we live within, whatever regulations we adopt, however many bureaucrats we hire to police those receiving government aid of one kind or another, there will always be a few people that will take advantage. But society’s relatively small population of free-loaders and fraudsters does not consist just of poor people, or even primarily so. A small number of doctors engage in Medicare/Medicaid fraud, while corporations pay small armies of lobbyists to make sure there are loopholes in the tax code large enough for an entire Brinks Truck full of money to be driven through. But it’s the poor for whom we reserve our harshest judgment. Corporate welfare and white-collar crime have, to my knowledge, never been major presidential campaign issues or become the focus of well-publicized congressional hearings and followup election fundraising appeals. Upon leaving the faith of my youth, I began attending a local Unitarian Universalist church. Included among the materials I picked up during one of my first Sunday visits was a list of the UU’s Seven Principles. First among them was “The inherent worth and dignity of every person.” There was no asterisk after this statement. Nowhere could I find small print listing the exceptions to this simple article of faith in humanity. Coming from a religion that spent considerable time emphasizing differences and put much effort into withholding its blessings, both eternal and temporal, from those deemed “unworthy”, this completely unconditional declaration of each person’s “inherent worth” was both radical and refreshing. But this is not a proselytizing pitch for the Unitarian Universalist Association. Their first principle is a Humanist one. Though they’ve taken it to heart and elevated it to first among equals in their list of values, they neither conceived of it nor own the rights to it. One need never set foot in a UU church to internalize it. But once we do so, our attitude toward each other is necessarily transformed. The implications for our treatment of the poor of such unconditional regard is profound. While helping people escape addiction, find work, or go back to school should remain a part of any anti-poverty effort we undertake, recognizing “the inherent worth and dignity” of each and every person liberates us from the judgmental obstacles inhibiting the unconditional assistance that actually addresses the lack of resources that define poverty. Food, clothing, shelter, healthcare; these are things EVERY man, woman, and child have a right to because each and every one has WORTH and DIGNITY. No person’s value as a human being is contingent upon their decisions, past, present or future. None of us are ultimately defined by our worst mistakes. Nobody deserves malnourishment or to suffer shelterless through a bitter winter beneath a thin blanket for ANY REASON. Politicians, self-righteous zealots of prosperity theology and lift yourself up by your bootstraps free marketeers will, of course, continue to cite examples of poor people making poor choices to excuse inaction. What they will never point out is that we all make poor choices now and then. The difference between being rich and being poor is the extent to which the rich can afford the consequences of their mistakes. 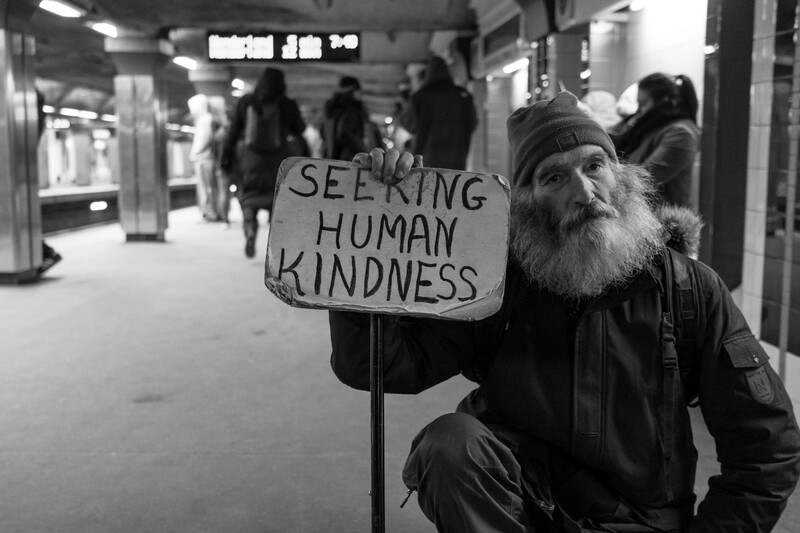 Only by uncompromisingly making each and every human’s inherent dignity and worth our first principle, both individually and as a society, can we avoid falling into the trap the notion of undeserving poor sets for us. There are absolutely no asterisks following any of our names. Note: I also recommend Elizabeth Bruenig’s excellent article “The Undeserving Poor: A Very Tiny History”. US citizen residing in British Columbia, Canada. Degrees include anthropology and environmental studies. Activism, politics, science, nature.